Japanese hotelier Okura has announced they will be opening their first outpost in Macau in 2009. The hotel, Hotel Okura Macau, will feature 26 stories and 400 rooms and be part of the Galaxy Cotai Mega Resort. Regular readers may remember when I originally posted the above quick and dirty photoshop rendering of the top secret Galaxy Cotai Mega Resort Autocad plans that I managed to get a hold of. 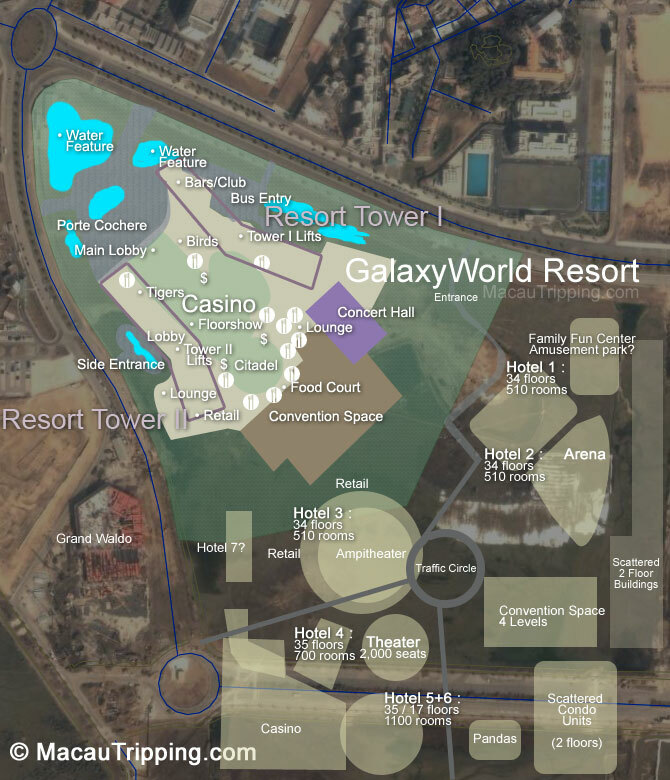 In addition to a Panda, Tiger and Bird displays, scattered throughout the Mega Resort, Galaxy has plans for at least 7 hotels in Mega Resort's Phase II. The stats released for Hotel Okura Macau don't match anything that was in the architectural renderings (26 stories, 400 rooms). I'm going to go out on a limb here and say that Hotel Okura Cotai/Macau is the barely outlined Hotel #7 which located on the west side of the GCMR parcel facing Grand Waldo. Or maybe not... I just got a hold of some new renderings of the parcel that have a bunch of different information... more on that later. It is interesting to note that there have been some rumors floating around that the reigns on the Cotai MegaResort project have been tightened up a little because Galaxy is having a difficult time raising funds. I can't confirm any of this, but if we've got any Galaxy executives or other insiders reading this blog (and I know we do) who want to anonymously spill the beans, you can email me at info@ this domain with the details. Same goes for you MelcoPBL, Wynn, SJM and MGM folks too... everybody wins when the boats on rising waters spring an anonymous leak.